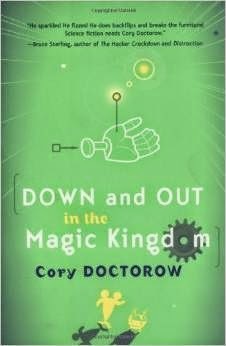 I finished off another book during that down time called "Down and Out In The Magic Kingdom"
This book was pretty strange. It is another recommendation from my husband (and something we already had on our shelf). I think I need to stop listening to his suggestions. It was a quick read - I will give it that. At just 200 pages, I was able to finish it up in a little more than a day of reading. It is set far into the future - people actually live in Disney World. The cast members that run the rides run the park, and there is a "war" that goes on among part of the different lands. The rides that we all know and love are still there, but have been made a bit better with time. But they try to keep the rides true to themselves. The park still operates as a park, even though people actually live there full time. That was the interesting part of the story. IT would be cool to have the park be in existece in 2400 and the beloved rides still there. But that is where the interesting part of this story stops. There is strange language that is never explained to the reader (which Mat tells me is the beauty of the book. "The characters know what it is, so they don't need to explain it" yeah yeah). Money is no longer a way you get things in life - it is social status, which is automatically uploaded to you through a chip that ever person has installed in their brain. You never die - you just get a new body when the old one wears out (or you are accidentally killed). You have to upload your memory continually into a database so that if you need a new body, you can pick up where you left off. It was a neat enough idea, and I - knowing my husband well - can see why he liked this book. He warned me it was strange, and it was. But I read it, and now I can move on.